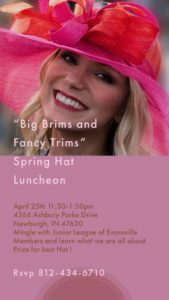 Big Brims and Fancy Trims Spring Hat Luncheon. Join us April 25th from 11:30 AM to 1:30 PM at 4266 Ashbury Parke Drive, Newburgh, IN. Mingle with Junior League of Evansville members and learn what we are all about. Prize for the best hat!